Someone in the energy business asked me not so long ago what I think my most important contribution to the energy conversation is. Was it the fact that I realized early on that Wind Power would be the first renewable energy other than hydropower and biomass to truly become competitive? And therefore was one of the first persons anywhere to actually sell wind power to a utility, much like an oil and gas producer sells his product into the market? Or, was it the fact that I co-founded the Texas Renewable Energy Association and successfully lobbied the right leaning Texas government to understand that Renewable Energy is just one more form of energy that should be employed by that great energy state, ultimately making Texas the greatest wind state in the country. Or, was it the subsequent development of the Texas Competitive Renewable Energy Zones that provide the electric super highways that move renewable energy from the west, where much of the wind and sun is, to the I 35 Corridor where the cities, the people, and the load is? Or was it my time working locally to envision what a long term sustainable energy plan for the City of Austin might look like, ultimately getting our community and the seventh largest public power company in the country to 35% renewable energy by the end of next year, four years early and without rate shock. Or during this time, was it my efforts blogging and imagining the Plug in Partners campaign that ultimately ended up with almost every major car manufacturer deciding to produce plug in vehicles that can run on the mix of wind and solar and other resources that make up our utility energy supply. You see, in today's world we have the stationary energy grid which is our electric system. And in this system, large utilities produce and sell energy to their customers and they send them a bill for it. And in the world of transportation, almost all energy comes from oil. Sure, there are electric subways and the like, but most of the energy comes from oil. In that kind of system, you have more stranded horsepower sitting in the parking lot of a football game than the electric utility has in all of its coal, nuclear, gas, and renewable power plants. In the Unified Energy Grid, utilities still sell their product to their customers but the customers also sell product back to the utility. 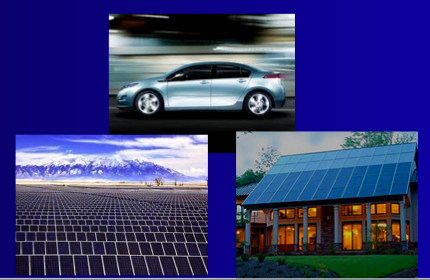 And instead of the transportation industry running exclusively on oil, it begins to slowly become transformed by electric drive cars and trucks that connect not only to the utility, but also to the dwellings which are also energy producers. And when the time arrives, those battery powered vehicles can provide energy and voltage support to the utility on the occasional peak load demand day. Moreover, larger plug in vehicles with on board generators can provide critical support and community resilience in times of storm outages. This triangle of generation, load, and transportation, each feeding to each other, each supporting each other, is then surrounded by a circle which stands for intelligence. The Unified Energy Grid is then made complete with smart grids, smart roads, smart buildings with smart appliances, and smart cars. And this grid is further supported by smart policies at the community and national level that foster and implement what R Buckminster Fuller called a Dymaxion World, which is the use of technology and resources to maximum advantage with a minimum of energy and materials. Well, starting about three months ago, I completed this triangle in my own life. Although almost all of my friends had Volts or Leafs years ago, I was still driving my Impala. It made the drive to my mountain home in Mexico very well, its 18 inch wheels and long wheel base making the final ascent to the top of the mountain on that historic cobblestone road a breeze compared to almost any other vehicle. Now I have GM's fancy Volt....and its pretty cool. One of the important facets of the plug-in vehicle that we imagined at AE was that it is a good imbodiment of the 80/20 rule. Why design an urban electric car to go 200 or 300 miles, when 80% of daily trips are under 40? Why not design an electric fuel vehicle that goes 40 miles and let a small efficient generator take over when you need to take a highway trip? Plus, with only 16 or so Kwhs to charge to get you that 40 miles, you can do it on a 120 volt circuit at 12 amps and be fully charged that next day. That way, the utility company can charge thousands of such vehicles with no infrastructure issues and you the homeowner don't have to bring in an electrician to do it. And after three months, I have used about 4 gallons of gas. And since the 9 gallon tank was full when I got the ELR, I have not purchased gas since I got the car. I'm probably making this up, but I think my health is better not breathing in a couple of hundred thousand volatile organic compound molecules every week as I don't fill up my car with gas. and the earth itself would begin to heal. Carbon dioxide is not the elixir of life. And too much water kills as sure as fire.